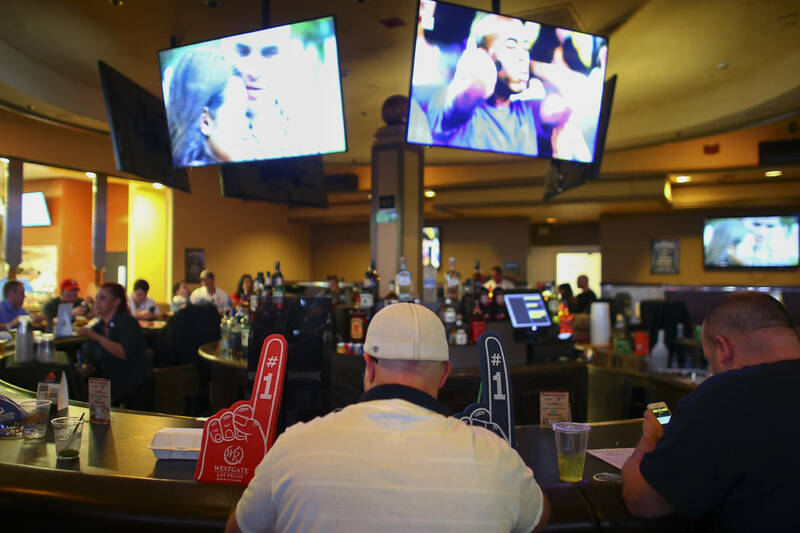 Watch NCAA Tournament games beginning Thursday at several locations across the Las Vegas Valley. If you are looking to watch the NCAA Tournament among fellow sports fans, you’re in luck. There are plenty of places around the valley to eat, drink and catch the games. 1. Pancho’s Mexican Restaurant (702-982-0111), 11020 Lavender Hill Drive., 89135: Mexican Baja wings at $15.95 until 7 p.m. Thursday to Sunday; drink specials include $3 off well drinks, $3 off house wines and $3 off flavored margaritas. 2. Cafe Americano in Caesars Palace (702-650-5921), 3570 S. Las Vegas Blvd. : Menu selections including lollipop wings, tacos, Southwest chili, cheesesteak flatbread, bacon fat fries, $5 pints of Bud Light and $30 buckets during games. 3. Budweiser Clydesdales/Top Golf (702-933-8458), 4627 Koval Lane, 89109: From 2-4 p.m. Thursday meet the Budweiser Clydesdales; $30 bucket specials on Budweiser, Bud Light and Michelob Ultra during tournament games all month. 4. El Cortez (800-634-6703), 651 E. Ogden Ave, 89101: Free viewing in the Fiesta Room, 9 a.m.-9 p.m. Thursday and Friday, 11 a.m.-9 p.m. Saturday and Sunday; $4 brats, $3 hot dogs, $3 Bud Light or Shock Top, $3 Coke, Diet Coke, Sprite. 5. Golden Nugget (702-385-7111), 129 E. Fremont St., 89101: VIP viewing packages (including seating in the VIP section of the Grand Events Center, all-you-can-eat stadium style food and four premium drink tickets) for $159 Thursday, $199 Friday, $119 Saturday and $89 Sunday. 6. Hard Rock Hotel (702-693-5000), 4455 Paradise Road, 89169: Viewing parties will be at venues around the resort, including Goose Island Pub. General admission tickets start at $135 per person, per day and include unlimited open bar. 7. Hoops and Hops/The Cosmopolitan of Las Vegas (702-698-7000), 3708 S. Las Vegas Blvd., 89109: Doors open from 7:30 a.m.-9:30 p.m. Thursday and Friday, 8:30 a.m.-9:30 p.m. Saturday. 8. MB Steak (702-483-4888), 4455 Paradise Road, 89169: Grilled wagyu hot dog priced at $29 along with Seven-Five Brewing Company’s Training Day beer by Golden Knights forward Ryan Reeves. 9. Mercato Della Pescheria (702-837-0309), 3377 S. Las Vegas Blvd., Suite 2410, 89109: Viewers get a complimentary Peroni draft with the purchase of a pizza with no food and beverage minimums. bratwurst for $4; Chicago dog, ballpark dog and chili and cheese dog for $5; a bacon-wrapped hot dog for $6. 11. Rampart Casino at the Resort at Summerlin (702-507-5900) 221 N. Rampart Blvd., 89145: Viewing begins at 9 a.m. inside the race and sportsbook with draft beers starting at $3. 12. Sapphire (702-869-0003), 3025 S. Sammy Davis Jr. Drive: Viewings feature all-inclusive food and drink deals with complimentary transportation to and from sportsbooks and a room dedicated to games. 13. Smoked Burgers and BBQ (702-836-2096), 3500 S. Las Vegas Blvd., 89109: All-you-can-eat menu Thursday through Saturday starting at 2 p.m. for $150 per person, which includes a premium open bar. 14. Red Rock Resort (702-797-7777), 11011 W. Charleston Blvd., 89135: March Madness viewing party; specials throughout the sportsbook and the on-site restaurants. 15. The Great Hall at Fashion Show, 3200 S. Las Vegas Blvd., 89109: Great Hall will feature a fan zone and large screens throughout the mall; Saturday, Sunday, March 30, March 31, April 6, April 8. 16. Therapy Restaurant (702-912-1622), 518 Fremont St., 89101: Beer buckets for $25; 90-ounce pitchers of Dos Equis or Coors Light for $25, or 90-ounce pitchers of Therapy’s handcrafted Guava beer or Therapy’s Duck IPA for $35. 17. Treasure Island (702-894-7111), 3300 S. Las Vegas Blvd., 89109: From Thursday to Saturday, the Treasure Island Ballroom will feature multiple large-screen TVs, cash bar, concessions and satellite betting stations. 18. Robert Irvine Public House (702-739-2307), 3801 S. Las Vegas Blvd., 89109: Basketball special menu available during games, including $10 appetizers and $5 drinks. 19. Tom’s Urban (702-740-6766), New York-New York, 3790 S. Las Vegas Blvd., 89109: Shamrock Swish special that includes Irish Hammer Shot cocktails ($6) and Bucket o’ Buds (five Buds or Bud Lights for $30). 20. PKWY Tavern, Tivoli Village, 400 S. Rampart Blvd., 89145: From Thursday to Sunday, there will be patio-side activities for families with drink specials during games.